On this month’s post for the Romancing the 8 blog hop with other TransCanada Romance Authors, I’m announcing my entry in a contest. 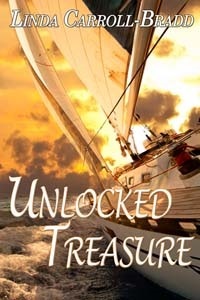 My Halloween-set novella, Unlocked Treasure, passed the nomination round for the Readers’ Choice Award sponsored by The Romance Reviews. From now until October 31st, voting continues and I’d love to have a good showing. Click here to be taken to the listing which appears in the Contemporary Romance category. A simple sign-in must be done. Aleen MacRae blames the lure of the sea for breaking apart first her family then her engagement. When her interest is caught by a man she sees both in person and in a dream, she resists—afraid to believe in her aunt’s prediction that her future is tied to the sea. Braden Williams is on the hunt for treasure buried centuries earlier by Rhode Island pirates. His search brings him to the property where Aleen lives. Collaboration on genealogy research draws them closer, and Braden steers her toward his true passion–sailing. Attending a party with Braden’s family lets her glimpse what she’s been missing. An unexpected discovery before her date with Braden forces a decision. Will Aleen play things safe or accept what this free-spirited man offers? My research revealed an unique event that takes place at Brown University in Providence, RI at midnight on Halloween night. Attendees enter a darkened Sayles Hall with flashlights and get comfortable. A spotlight highlights the balcony and an organ recital begins. Does your city have a one-of-a-kind event to celebrate the holiday?